Pyroplex® Fire Rated Silicone Sealant is a one part, low modulus, neutral cure, halogen free product. 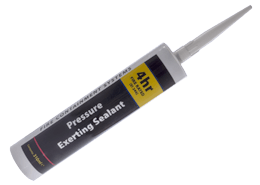 It is suitable for the sealing of construction joints and around pipe penetrations which have been protected by the recommended Pyroplex® intumescent product. It is also ideal for the weathersealing of curtain walling, building facades and expansion joints in fire rated walls. It is fire rated up to 4 hours and offers excellent adhesion to many common building substrates. It has outstanding resistance to ozone, UV and temperature extremes and is tack free within two hours. Fire resistance up to 240 minutes. Outstanding resistance to ozone, UV and temperature extremes. Excellent adhesion to many common building substrates. Fast cure [tack free in 2 hours]. 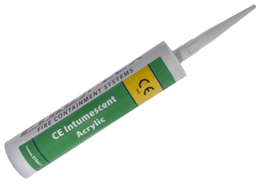 Pyroplex® Fire Rated Silicone Sealant is fire rated – it is not intumescent. Sealing linear gap joint seals. Sealing around metallic pipe penetrations. Sealing around plastic pipe or cable penetrations which have been protected with the recommended Pyroplex® intumescent product eg. pipe collar, pipe wrap. 1. For external applications ensure that all the surfaces are clean, dry, sound and frost free. Clean all joints thoroughly to ensure that the adhesion of the silicone to the substrate is not impaired. 2. It may be necessary to mask adjacent areas to prevent contamination and to ensure a neat sealant line. Masking tapes should be immediately removed after tooling and finishing. 3. Install backing materials as required and fill the cavity or void with silicone. 4. The joint should be tooled within 5 minutes of application to ensure good contact between the silicone and substrate. Tooling of the sealant also gives a smooth and professional finish. 5. Excess silicone should be cleaned off and non-porous surfaces cleaned whilst in an uncured state using a suitable solvent. Sealant adhering to porous surfaces should be left until it has cured, then remove by mechanical means. 6. Dispose of spent cartridges in accordance with local regulations. A number of independent fire resistance tests have been carried out to confirm the suitability of the product and to demonstrate product compliance by utilising BS 476: Part 20, BS EN 1366-4 and other international standards. Pyroplex® Fire Rated Silicone Sealant has a European Classification EI240 in accordance with BS EN 13501-2. Providing the product is installed in accordance with the requirements of the guidance document, the fire performance characteristics of the product is guaranteed for a period of 10 years.